Windows desktop is a convenient place to store files, folders and shortcuts. After all, it’s the place that’s most easily visible and accessible. However, that convenience means that it’s way too easy to allow your desktop to become cluttered, making it difficult to find what you’re looking for and thus making you less productive. And that defeats the purpose of storing things on the desktop in the first place. Here’s how to keep your desktop organized and banish the clutter forever. It’s always a good idea to get rid of files you don’t need, rather than just moving them somewhere else. Wherever they are, they’ll take up space. If space is short on your PC, however, dragging a few files and folders to the Recycle Bin isn’t going to free up very much. A PC cleaning program, on the other hand, will identify potentially hundreds of files you probably don’t need and allow you to delete them all at the press of a button, or review the files it’s found and choose which ones to get rid of. CleanMyPC’s My Computer module scans your PC for all sorts of junk files and displays the results, allowing you to review them and decide what to delete. Or you can press ‘Clean’ to get rid of everything. CleanMyPC also has a File Shredder utility that securely deletes files that contain sensitive data, so you can be sure they are completely erased from your computer with no chance of restoring. It’s fine to store files and folders on the desktop temporarily while you’re working on a project and if you really think it’s too much trouble to navigate to your Documents folder. But if you do that, get into the habit of filing them properly when you’ve finished working with them. That could be at the end of a work session, the end of a day or when you’ve finished a particular project, whatever works for you. Just make sure you commit to doing it. If you don’t think you can commit to clearing your desktop of clutter regularly, then don’t save files to the desktop at all. Ever. When you save a file for the first time, create a folder for it in your Documents folder. Save attachments and downloads to your Documents folder and keep all files that relate to a project together. If you never put files and folders on the desktop, it will never become cluttered. Don’t think you can avoid saving files to your desktop or commit to clearing them regularly? Then at least create folders on your desktop and put files in there. It’s much better to have a handful of folders properly organized than files scattered all over the place. You could start by creating folders for different types of file, say documents, photos, and application shortcuts. A better method of dealing with the shortcuts that applications place on your desktop when you install them is to pin them to the taskbar and clear the space on your desktop. Just right-click on a shortcut and choose “Pin to taskbar” from the dropdown menu. Once it’s pinned to the taskbar, you can drag a shortcut left or right to place it exactly where you want it. You can also pin shortcuts to the Start menu. In Windows 10, the shortcut will appear as a tile on the right side of the menu. Once you’ve pinned all the apps you want to the Start menu, you can drag them around to put them in the order you want and even organize them into groups. To pin a shortcut to the Start menu, right-click on it on the desktop and choose “Pin to Start”. If your Start menu becomes cluttered, you can remove items put there by default by right-clicking and choosing “unpin”. Once you’ve pinned apps to the taskbar or Start menu, you can delete the shortcuts from the desktop. We call this a cheat, because it doesn’t remove items for your desktop, or even organize them, it just hides them. It does at least make your desktop look tidier. 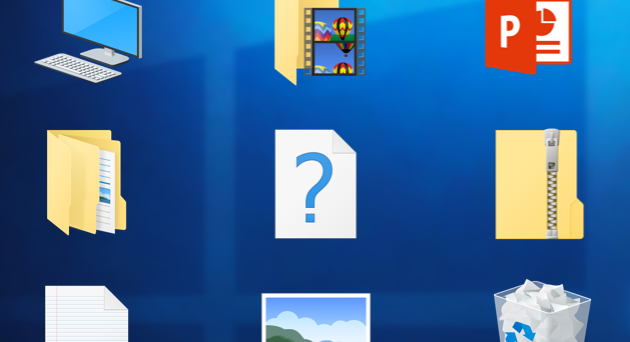 To hide everything on your desktop, right-click anywhere on the desktop and choose “Show desktop icons” from the menu. If the items are currently showing, they’ll be hidden. To show them again, yep, you guessed it, just repeat the step. There are lots of apps for Windows that will help you keep your desktop organized. One, for example, splits your desktop into regions and separates them with ‘fences’ files are automatically placed into regions based on their type: photos, documents, movies, etc. And there are other apps that emulate the Stacks feature in macOS Mojave. If you don’t want to keep your desktop tidy by yourself and think an app might help, it’s worth doing some research to find the one that best suits your needs. Keeping your desktop clean and organized is an important aid to productivity. A messy desktop makes it difficult to to find what you’re looking for, risks you dragging files to the Recycle Bin by accident, and can impact the performance of your PC. Fortunately, if you use the tips above, keeping your desktop tidy is very easy. And, if you use CleanMyPC to get rid of files you don’t need, you’ll free up disk space and make your PC more secure in the process.